Woodward Ave. @ 13 Mile and Coolidge Hwy. Note: There is plenty of free parking in the 13 Mile & Coolidge lot. Please leave pets at home. Our artists number over 100 local, regional and nationally known individuals specializing in all mediums of fine art. Juried in under many categories, artists specialize in Ceramics; Collage; Drawing; Jewelry; Wood; Fiber; Metals; Painting – including Acrylics, Oil, Watercolor; Pastels; Photography; Sculpture & more. At the fair you will find home accents for indoors and out to enjoy while at the fair and to take home and call your own. And for your entertainment, the art fair prides itself in having some of the finest local performers including vocal and instrumental groups playing for attendees multiple times each day of the fair. Many of our visitors come to shop the art, then pull up a chair to enjoy the music and the beautiful park setting – relaxing on a fine summer’s day. 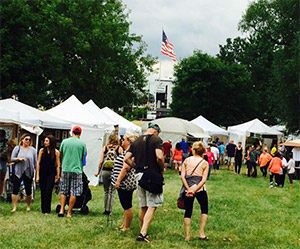 Proceeds from the art fair provide scholarships for local youth, grants for local art-related organizations (see pARTners) as well as support for Youth programs offered through the Royal Oak Recreation Department. We hope you’ll join us as we celebrate our 49th Annual Royal Oak Outdoor Art Fair – bigger and better than ever!